The book that inspired the blockbuster film, The Passion of the Christ. Faithful to the Biblical account of the Passion, it fills in many hitherto unknown details. Edifying, inspiring, surprising, and heart-rending, Emmerich's descriptions of our Lord's Passion will melt a heart of stone. This book is the best on the Passion we have seen. It also wonderfully portrays the Blessed Mother's role in our redemption. Includes a short biography of Sr. Emmerich. A great book for the whole family! Impr. 404 pgs, PB. 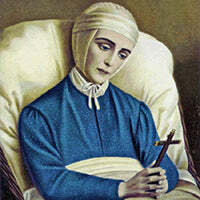 Blessed Anne Catherine Emmerich was a Roman Catholic Augustinian Canoness Regular of Windesheim, mystic, Marian visionary, ecstatic and stigmatist. She is notable for her visions on the life and passion of Jesus Christ, reputed to be revealed to her by the Blessed Virgin Mary under religious ecstasy. Emmerich was beatified on 3 October 2004, by Pope John Paul II. However, the Vatican focused on her own personal piety rather than the religious writings associated to her by Clemens Brentano. Her documents of postulation towards canonization is handled by the Priestly Fraternity of St. Peter.